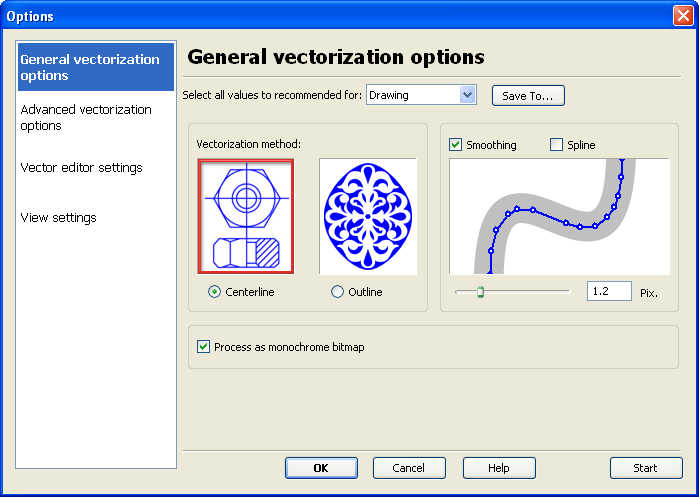 Vectorization options can be customized through the Vector|Options menu. Selection of predefined parameters set. You can define and save your own set ofparametres by "Save To" button. Smoothing or approximation of polylines, may help you significantly reduce vector data size. Just enable Smoothing and set the smoothing value (in pixels). Spline option produce polylines smoothing with Bezier curves. This option has the effect of reducing the curvature of polylines and making them look smoother. 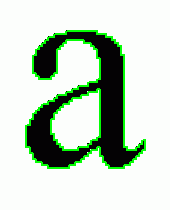 When this option is selected all raster images interpreted as monochrome bitmaps. During vectorization all true color or palleted images will be temporaly converted to 1 bip/pixel monochrome bitmaps by some adaptive threshold. This conversion does not affected on raster image after vectorization.